Ruling the eCommerce sphere is not just about getting the right customers. But also keeping them interested in your store and offer them a great experience. Once you’ve attracted leads to your online store, it should be a breeze to turn them into paying customers, right? Your products may excel, your web design may stand out. But chances are, people are opting out of your site just because your instant support is nowhere to be found. In the brick and mortar world, you’d accomplish that in large part through personal touches that make every visitor feel like a VIP. Like any brick-and-mortar store, an online shop can deliver similar personal touches online by using real-time communication – live chat. In recent years, live chat has gained a lot of popularity. A Forrester customer survey shows that 44% of online customers consider live chat as one of the most important features of any e-commerce site. If you think that this is good news for you, then this will get even better. According to MarTech, 51% of customers are more likely to purchase from a site that offers live chat. In addition, almost half of them saying they’re more likely to return to a website with a live chat option. 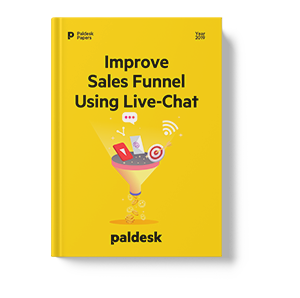 The adoption of live chat services is becoming a way that e-commerce retailers are adjusting their strategies to reach customers in new and innovative ways. Online and mobile shopping has given consumers more choice and flexibility to shop. So, retailers are approaching in a different way to keep the pace. Why implement live chat into your ecommerce store? How your live chat agent interacts with a visitor places a huge impact on his/her buying decision. Tip for securing the deal is to choose the right approach and leave the best impression. Online shoppers are often looking for instant gratification. If your shop can’t provide them with the product they need, they will look elsewhere. Live chat can be a way to ‘save’ these potential customers from leaving your site. By answering their questions promptly, you can keep them engaged and edge them closer and closer towards making a purchase. Using live chat technology, you can proactively reach out to your site’s visitors, facilitating engagement with them in the process. By this, you make clear that you’re ready to help them. Upselling and cross-selling are well-known tactics on how to increase your sales. If you are not familiar with them, then let’s explain them. Upselling is a tactic used to present a more valuable product or service to a customer who is interested in a product of lesser value. On the other hand, cross-selling is a tactic of presenting additional or complementary items or services along with a product or service that a customer is interested in. While there are many ways to automate upselling and cross-selling offers on your site, live chat allows you to proactively personalize these offers for each of your customers. Suggestions generated via algorithms can produce not as accurate suggestion like a real person via live chat can. As a result of implementing live chat on your e-commerce site, you can end up making additional purchases from your customers. The picture shows that chat has killed the phone call, by over 60% of millennials preferred to use live chat when wanting to ask a question. They found that when surveying millennials, live chat was their preferred channel because of two main reasons: no hold times and convenience. Almost 40% of Millennials said they liked the no hold times and nearly 30% sited convenience. Live chat enables you to inform your visitors that you’re readily available whenever they need you. Customers may be struggling to get to check out because they can’t find the right product, or they have questions. If you’re not helping customers while they’re on your site, considering a purchase, or trying to complete a transaction, then you’re throwing money in the air. Live chat always made it possible for your business to communicate with your customers on an authentic, human-to-human interaction. But, not many businesses turn that in their favor. Essentially, live chat enables you to adapt to each individual customer. This all ties back into building trust and forging a long-term relationship with your customers. How to Integrate Live Chat on a E-Commerce Site? Let’s see how you can integrate live chat in one of the most popular e-commerce platforms: PrestaShop and Magento. Give your PrestaShop and Magento customers exceptional real-time support with live chat. On PrestaShop you can easily install live chat, just by downloading a module which you upload when you login into your PrestaShop account. If you are using Magento, you will probably download it from Magento marketplace and then configure it in the installation root directory. Of course, there are many other e-commerce platforms to choose from, but we won’t cover them all. But when you do set up the live chat on your site, you will have options to choose from on how to personalize your widgets. Many e-commerce sites are not aware of the importance of implementing live chat feature in their online businesses. The chat increases the potential of your business. But, this is applicable only when you apply it correctly in your business. Customers come to your site ready to buy. Don’t let your live chat become a distraction and pull their attention away from completing a transaction. One of the challenges with e-commerce is that your visitors can’t connect with someone who can answer their questions at the same moment. Therefore, live chat is an essential concept that every e-commerce companies should try.